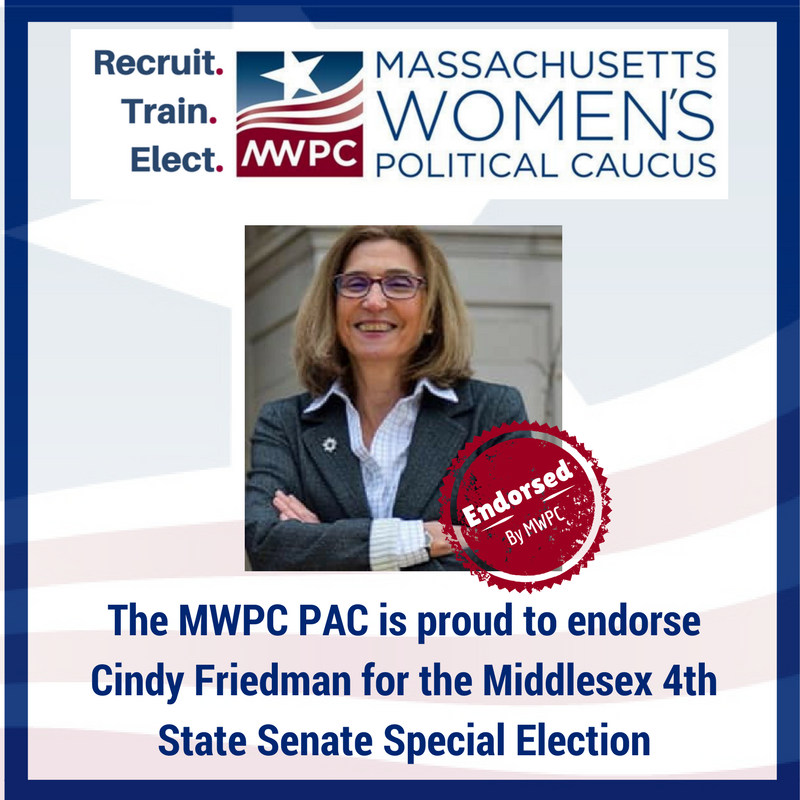 The Massachusetts Women’s Political Caucus Political Action Committee (PAC) is proud to announce its endorsement of Cindy Friedman (D) for State Senate of the 4th Middlesex district, which includes Arlington, Burlington, Billerica, Woburn, and parts of Lexington. The primary election will be held on Tuesday, June 27th, and the general election is on Tuesday, July 25th. Cindy Friedman has lived in Arlington for the past 32 years with her husband John and her three children. Cindy was a long time Town-Meeting Member; chaired of the Arlington No Place for Hate Committee; co-founder of the Arlington Schools Foundation (now the Arlington Education Foundation). She also chaired the Symmes Community outreach Sub-Committee, which assisted a neighborhood impacted by a major real estate development project. She has been a director in the high-tech industry, a teacher, and a community activist. 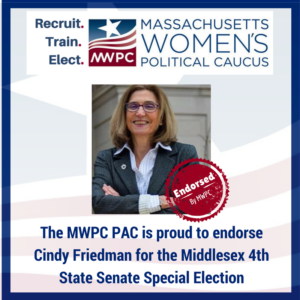 The Massachusetts Women’s Political Caucus Political Action Committee is a multi-partisan organization that works to increase the number of women elected and appointed to public office and public policy positions and to increase the involvement of women of all ages in the political process. Please visit http://www.mwpc.org to learn more about our Political Action Committee.